This AQUA SOLUTIONS unit operates on ordinary tapwater. For pretreated water operations, see (Model: 2035B). 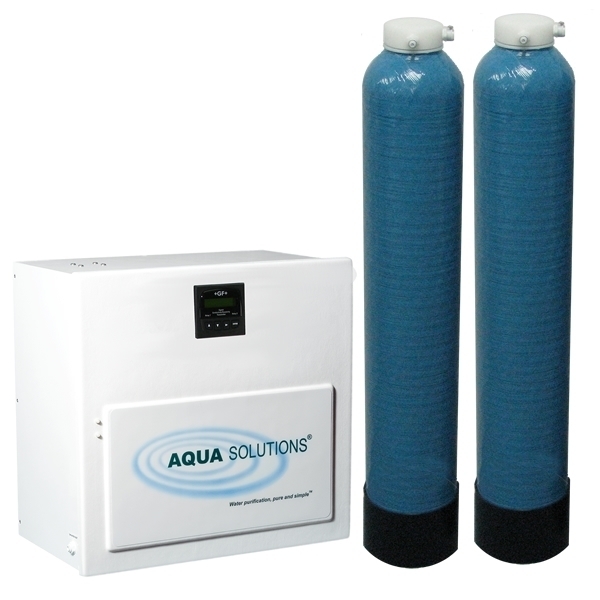 Laboratory water purification systems are also available with a built-in sterilizer (Model: 2036BU) or with a built-in Dual wavelength UV Oxidizer/Sterilizer (Model: 2036BL). This system produces 18.2 Megohm-cm type I ultrapure, reagent grade water that is free of Pyrogen, Endotoxin, RNase and DNase at a flow rate of 8-12 Liters/minute. The unit is utilized in operations involving pretreated feed water that contains less than 20 PPM of total dissolved solids. It includes a built-in 5,000 MWCO ultrafilter cartridge and a cabinet that can be bench, shelf or wall-mounted at no extra charge. All AQUA SOLUTIONS Bilogical Grade Type I DI Laboratory Water Purification Systems produce purified water that meets or exceeds ASTM, CAP and CLSI specifications for Type I reagent grade water.